Ultrafiltration is one of the membrane separation techniques which is the driving force of pressure. The hollow fiber ultra-filter (film) has the advantages of high filling density and small area. Ultrafiltration is a kind of screen is divided into separation principle, with pressure as the driving force of membrane separation process, filtration precision within the scope of 0.005 to 0.01 microns, which can effectively remove the particles in the water, colloid, bacteria, heat source and the macromolecule organic matter. It can be widely used in separation, concentration and purification of matter. 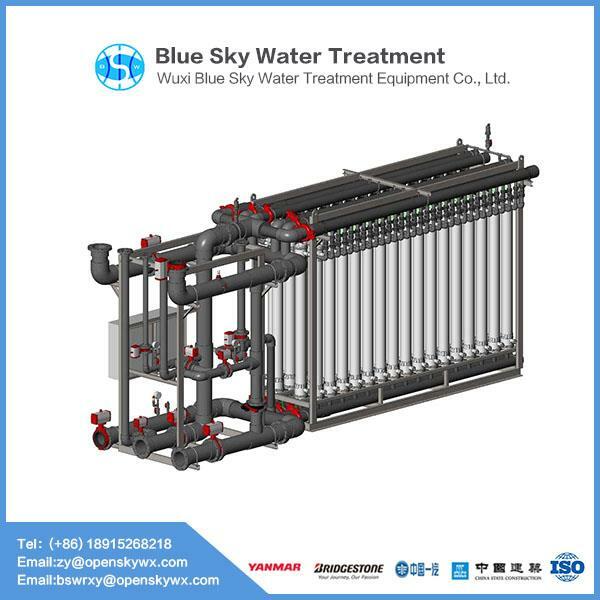 Ultrafiltration process without phase transformation, room temperature operation, the separation of heat sensitive material is appropriate, and has good heat resistance, acid and alkali resistance and oxidation resistance, can under 60 ℃, pH of 2-11 under the condition of continuous use for a long time. Classification of ultrafiltration membrane: the ultrafiltration membrane is divided into plate frame type (plate type), hollow fiber type, tube type and volume type. The hollow fiber ultrafiltration membrane is one of the most mature and advanced forms in ultrafiltration. The outer diameter of hollow fiber is 0.4-2.0mm, the inner diameter is 0.3-1.4mm, the wall of hollow fiber tube is full of microspores, and the pore diameter is expressed as the molecular weight of the material that can be trapped, and the molecular weight can reach several thousand to hundreds of thousands. The original water is pressurized by the lateral or inner cavity of the hollow fiber, respectively forming the outer pressure type and the inner pressure hollow ultrafiltration membrane. Ultrafiltration is a process of dynamic filtration. The trapped material can be removed from the concentrated liquid without blocking the surface of the membrane, which can be operated continuously for a long time. Application of ultrafiltration technology: early industrial ultrafiltration is applied to wastewater and sewage treatment. For over 30 years, with the development of ultrafiltration technology, the field of the application of ultrafiltration membrane technology has now is very wide, mainly including the food industry, beverage industry, dairy industry, fermentation, biological medicine, medicine, chemical, biological agents, Chinese medicine, clinical medicine, printing and dyeing wastewater, food industry wastewater treatment, recycling and environmental engineering, etc. Next: What are the main methods of wastewater treatment?